Written by: Amy on September 17, 2012. Welcome to the 7th review in Reviews for Writers, where books are viewed with an eye towards craft. I started this book as I was going to bed, intending to read a chapter or two to wind down, and go to sleep. Before I knew it, it was 5am, and I had finished the novel. 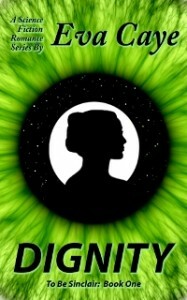 Dignity, by Eva Caye, is a beautifully written, well-crafted science fiction romance. It is also a fine example of excellent character development, even better relationship development, and world building in the form of a complex interplanetary political and governmental framework. The main character, Felicia, is a student at university working towards her degree in science. She is a member of the noble class, called Royals in the context of this world. She lives in a sorority (reminiscent of a finishing school) within walking distance of the university she attends. She spends her time attending classes at the university, and learning more traditional skills for a lady of her class at her sorority. She is a serious scientist, and her thought processes and behaviors reflect this unfailingly. She works through problems she encounters with thoughtful and logical consideration. She is not unemotional; she has emotional responses and reactions, but usually has the sense to realize when her emotions may cause her to behave irrationally. When this happens, she either asks for, or arranges for, time to process. This was a welcome change from many characters in fiction I have read, who seem to lose every ounce of their intelligence and good sense when faced with the slightest hint of a crisis. The male lead, Victor, is the emperor of the Sinclair Demesnes. He became emperor at a young age, when his mother was killed in an attempted coup. He has so many responsibilities, he has to struggle constantly (and often unsuccessfully) to get even a few hours of free time every week. He also suffers from bouts of depression. He, like Felicia, is extremely intelligent. He has a deep understanding of people and behavior, and a very high level of empathy. This type of intelligence, and the ability to use the information he garners about people to deal with social and political situations, make him believable as an emperor of a multi-planet empire. He has been searching for a wife for some time, but is unsatisfied with the candidates he has met thus far. When he meets Felicia, he realizes he has found a kindred spirit… someone he can love, and respect enough to make his empress. Felicia and Victor are both well-developed, and their relationship is extremely well-developed. They are attracted to each other almost immediately, and Victor forms a strong attachment very quickly, certain that he loves Felicia, and wants her to become his empress. Although Felicia likes the emperor, it takes her longer to be certain that they are good match. She is well aware that Victor the man cannot be entirely separated from his role as Emperor, and she wants to consider if she loves him enough to make the adjustments to her future that becoming Empress would require. She is a brilliant scientist, who knows the value of her intellect and her work, and what she might accomplish in service to mankind through science. I particularly appreciated that that Felicia didn’t reject Victor, or write off a relationship as impossible. Instead, she and Victor worked together to come up with a way for her to finish her education, and move forward with her research even if she became Empress. The characters clearly respect each other’s intellect. Through multiple interactions, and a unique exchange of cultural material and letters, they develop a strong bond that ripens as time passes. Mutual respect and understanding for the other’s strengths and weaknesses form the bedrock of their relationship, so the reader is sure of the soundness of the relationship by the end of the novel. I would like to point out (with a certain amount of glee) that the author has managed to write a scifi romance without relying on The Big Misunderstanding of romance, or (as is more commonly seen in SciFi romance) The Inadvertent or Perceived Betrayal for the climax of the story or the major conflict. I was absolutely thrilled about this; while there is nothing wrong with either of the aforementioned tried-and-true plot devices, they are (dare I say it) a trifle overused. And, in this case, using either would have been out of place… disrespectful of the intellect of the main characters and the nature of their strong relationship dynamic. The characters do have misunderstandings, and occasionally hurt each other, but this is not the main conflict, and the resolution is always satisfying, and helps enhance the reader’s respect for the characters. The main conflict in Dignity lies in the characters learning how to nurture a relationship against the backdrop of the political and social expectations and pressures of being royalty. Victor is the Emperor, so his actions, and the actions of the future Empress affect many people, and have far reaching political consequences. The complexity of this situation is not minimized, rather, the determination, intelligence, and resourcefulness of the characters is highlighted as they work through each difficulty. As far as the technical aspects of writing go, the writing quality was excellent: polished, smooth prose that flowed beautifully. The pacing was perfect. Each page made me want to turn to the next, and each chapter made me eager to see what developments would unfold in the following chapter. The ending of the book left me entirely satisfied, while still eager for a sequel. Overall, reading this book was an extremely pleasant experience. The story was excellent, and the characters were easy to like. Reading about the characters and the way they manage their problems and develop their relationship made me smile, and provided a satisfying sense of vicarious accomplishment; I felt invested in their lives, and happiness. Dignity is the first installment of the To Be Sinclair series. I highly recommend it, and am eagerly waiting the sequel. Dignity (To Be Sinclair Book 1), can be purchased on Amazon, here. Read more about the author, Eva Caye, on her website.